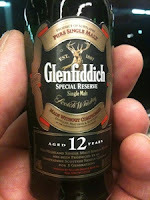 The Coopered Tot: Glenfiddich 12 On Demand Re-Review: A Recent Bottling. Has It Changed? 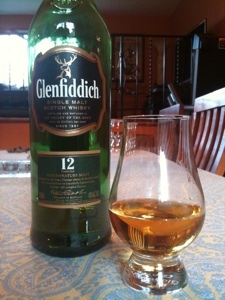 Glenfiddich 12 On Demand Re-Review: A Recent Bottling. Has It Changed? The new stuff at Gurinder's generous table. "...you should also seek out another sample of the 12yo. Why? Because the miniature in your picture was bottled (I'd guess) around 5-10 years ago. The label has changed at least twice since then (check our website for the current labelling, so you know what you're looking for) and the whisky itself has been on a gradual journey since that no-age-statement bottle you remember so vividly." In other words, 'try the new stuff because Glenfiddich 12 has changed'. I wasted no time lambasting Glenfiddich some more for having disappointed me in the past. But, really, shouldn't a product be permitted to change - if the change is for the better? Better educated whisky drinkers will choose better whisky to drink and the marketplace will adapt with better whisky. Savvy distillers should be praised for getting ahead of the game and coming up with better whisky. Why not upgrade the flavor profile of the top sellers? The problem is that big brands acquire an inertia. No one liked New Coke. "Don't mess with success" and all that. I didn't, in my heart, believe that Glenfiddich really had changed its flavor profile. "Gradual journeys" for top marks like Glenfiddich 12 seemed a bit too much to be believed. But, as always, the proof is in the glass. My friend Gurinder (who had poured me a dram of Glenfiddich 12 at a lovely soire back in February - the original inspiration to write about Glendfiddich 12) was nice enough to pour me a generous dram yesterday and allow me the antisocial splendor of a slow meditative critical tasting session. Glenfiddich 12 bottle from the 2011 holiday gift set 40% abv, 750ml. (The gift set included a Glencairn glass etched with the Glenfiddich logo) - glass is visible in photo at top left holding a dram). Nose: green pears, honeydew melon, honeysuckle floral notes, and clover honey. The nose is really nice and gets better with time. After 30 minutes it had achieved full bloom. Fresh, floral, and fruity in the Speyside manner. Entry is clean and light with malt cereal oats and honey. The midpalate rest on a decent light malt body foundation. There are flavors of oatmeal, a hint of mint, green apple, and grassy spring meadow notes. It's not big - but there are no mis-steps. The finish is gentle and brief and fades to mineral note (chalk like the cliffs of Dover) with slight bitter edge. Bottom line, better than inoffensive - pretty good actually, for a single malt at this price level ($41 at Shopper's Vineyard, and $35 on line). My most significant criticism is that the nose is bigger and more delicious than the flavor. Three stars. I have no problem recommending this as a gentle Spey. So, has the flavor profile changed? That is certainly my experience. Am I a huge fan of Glenfiddich? Not yet - but I'm willing to admit that things have gotten better. I'll continue to seek out the other Glenfiddich expressions to try and will keep an open mind. Josh, you're a gentleman and a scholar. Many thanks for keeping an open mind and being adventurous enough to try again. Hope you enjoy the other expressions. 15yo and Rich Oak (14yo) might really surprise you! Keep me posted! Jamie, if you don't mind me asking, what's the status of the Glenfiddich Distillery Edition in the States right now? It's still listed on the U.K. website, but not the U.S. version. It'd be a real shame if that wasn't coming over here anymore, because it's a genuinely solid whisky. Josh, that lines up almost perfectly with my impressions, also from the same mini tri-pack. I liked what smells flavors were there, they were just too weak for me to give it a really big thumbs up. Jamie, much as it slays me to give you satisfaction, I must admit you were correct about the point. Thanks for tips about future dramming and the reply on twitter. hang on to it. Any thoughts? It wasn't my personal favorite - and it doesn't have particular value on the collector market yet. But it's a nice floral pretty Highland malt with sweetness, honey and heather. If that's your flavor bag - drink it. If not, find someone who loves that sort of thing. Dusty whiskies are cool these days!